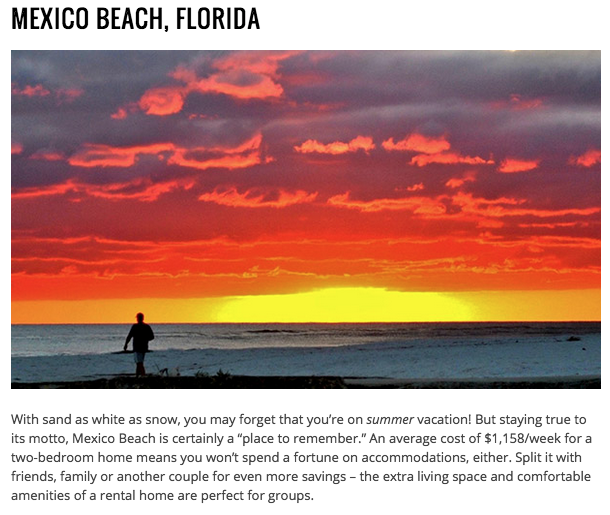 Mexico Beach Named as a Top Affordable Vacation Rental Destination by TripAdvisor! We are so excited to be listed as one of the top “29 Super Affordable Vacation Rental Destinations You Need to Visit”by TripAdvisor this summer! TripAdvisor, one of the top vacation destination ratings sites, analyzed over 150 destinations across the United States to compare the prices of two-bedroom vacation homes during the summer, and Mexico Beach, Florida, came in the top 29 list for the most fun, most affordable getaways! 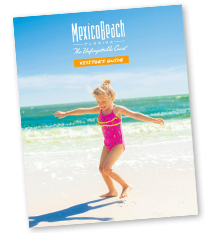 At Mexico Beach we pride ourselves on being a relaxing beach destination for families, couples, or groups who are looking to get off the beaten path and away from the hustle and bustle of high-rise condos and constant traffic. We have the hometown feel people get when they imagine the way Old Florida used to be, with locally owned and operated shops and restaurants, gorgeous scenery, and charming vacation homes on the beach, the canal, and everywhere in between. Here, guests can take a stroll on sugar-white sands while they marvel at the shimmering Gulf of Mexico. Grab a line and a pole and hit the Mexico Beach Marina to pick up your fishing licenses and gear for a day on the water, on the pier, or casting a line from the beach. Hit all the shops for handmade jewelry and pottery, or browse until you find that perfect souvenir from your trip. Then head to Toucan’s on the beach for a drink and a bite to eat while you watch the sunset! From beach bums to outdoor adventurers, we’ve got something for everyone, so come and make some memories on the Unforgettable Coast! It’s not too late to book your summer or fall getaway to Mexico Beach. Visit our Places to Stay page to find your perfect vacation rental!